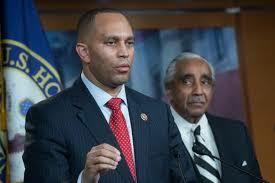 WASHINGTON, DC – U.S. Rep. Hakeem Jeffries (NY-08), a member of House Democratic leadership and the Congressional Black Caucus, took to the House floor today to blast President Trump and his associates for their apparent willlingness to sell out our country to Putin's Russia. More like this, please. But it brings up the question of what the consequences should be... if the election was rigged, what should happen? We need the Democrats to say it out loud.